Apple Montessori commemorates 45 years of providing quality early childhood education to local communities. Apple Montessori students, parents, and team members gathered on the waterfront at Pier A in Hoboken for a special celebration on October 18. The occasion? Commemorating the 45 years that Apple has provided quality early childhood education to local communities. The event was a resounding success with families from various Apple locations in north and central NJ, as well as Apple team members, joining together for the celebration. 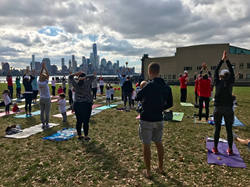 The lawn was spotted with moms, dads, children and strollers as they gathered together with Apple staff and teachers for yoga, lawn games, and educational crafts. The children (and some of the grownups, too) even got to shake hands with a real celebrity when Mickey Mouse made an appearance. It couldn’t have been so successful without contributions from local businesses. The crowd enjoyed refreshments and healthy snacks thanks to Green Life Market. Real Hot Yoga sponsored the yoga mats that allowed both the adults and the little ones to kick off their shoes, stretch, and get centered and relaxed. Although Apple Montessori has 15 schools, the event was hosted in Hoboken because it is the site of Apple’s newest school, located on Sinatra Drive for children ages 6 weeks to 6 years. The day ended with a ribbon cutting ceremony led by local councilman (and Apple parent) Dr. Michael Russo. Celebrating Apple’s 45th anniversary at the school’s newest location demonstrated that the school is not only looking back on 45 wonderful years being part of local communities, but also looking forward to being an important part of local families’ lives for years to come. Family-owned Apple Montessori Schools uses the Montessori approach to nurture the whole child and foster a life-long love of learning, positive social development, and personal confidence and independence. Academically, Apple students thrive as well. Last year, 92% of Apple’s kindergarten students scored at least one year above their grade level in both Mathematics and Language, with some scoring as high as 4th grade levels. About Apple Montessori Schools: Family owned Apple Montessori Schools have inspired a love of learning for over 45 years. The infant, toddler, preschool/kindergarten, and elementary programs are not only child-inspired, they are research-proven. The core of Apple’s mission is nurturing the whole child – intellectually, socially, emotionally, and beyond. By recognizing that no two children are the same, Apple’s approach cultivates the unique potential of each and every child in a caring, safe, and supportive school environment. The school’s team of educators, many of whom have been with Apple 5, 10, 20 and even 30 years, make the most of children’s critical early learning years. Apple Montessori has fifteen schools located in north and central New Jersey. Learn more by visiting http://www.applemontessorischools.com.